Kiwi is the sleepy donkey. Most people who visit Clovelly will remember Kiwi because his usual job is standing in the village street to be photographed. He is so calm that he does not get bored for a long time. However he does know when it is time to go home and wakes up, yawns and tosses his head to let you know it. 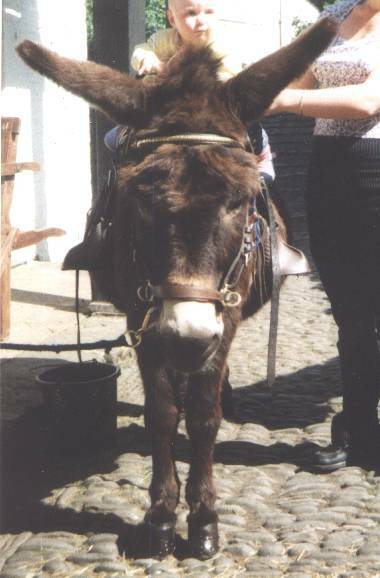 He is good at doing donkey rides as he is easy to lead but he walks fast. When he is tired he pushes you in the back of the knee with his nose to tell you. 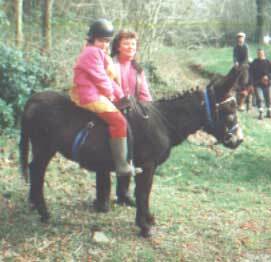 He is an easy donkey for the children to ride off the lead but he won't jump; he just stops and looks at the jumps and says "What, me?" . He pulls the cart too. He's not entirely an angel as he is one of the donkeys who likes to 'accidentally' miss the gate to the field and trot off down the road! 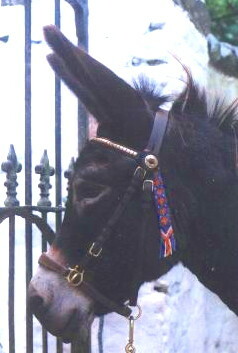 Kiwi retired from giving donkey rides in 2001. Kiwi's best friend is Barney. They often go around together and Kiwi likes to rest his head on Barney's back. We call them 'The Dominoes' because one is black and one is white and they go around together. 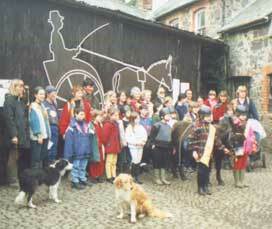 Here are some pictures from one of our Sponsored rides (1999 - in aid of SPANA). This is Kiwi brushed, tacked up and ready to go. 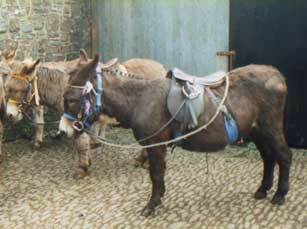 At one time the manager of the New Inn was from New Zealand so he called one of his donkeys Kiwi. She carried luggage up the cobbles for visitors leaving the New Inn. When she retired a lady in Fairy Cross adopted her. 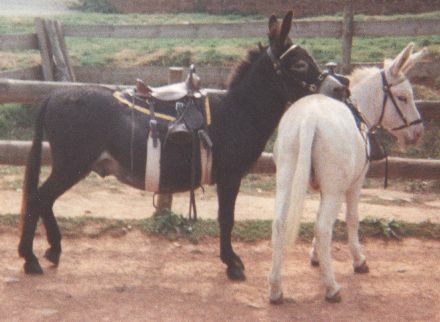 Eventually Kiwi died but at the same time one of the lady's other donkeys had a foal so the lady named the foal Kiwi in memory of the old donkey. When Kiwi was 6 he came to Clovelly with his friend Barney. You can still see the original Kiwi's name painted on a post in the stables although our Kiwi lives in the pen next door. 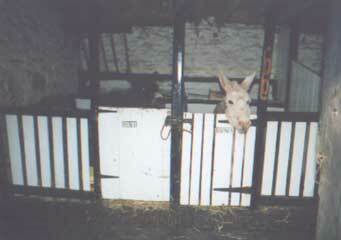 Top of Page We are very sad that Kiwi died in the winter of 2006-7 from colic. 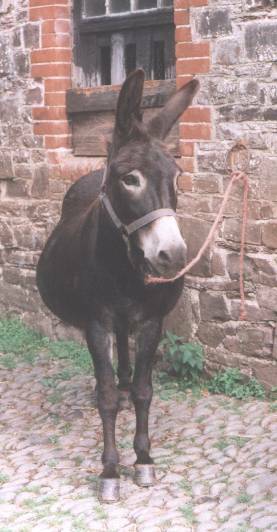 We miss him very much as he was one of our original four donkeys and a very unique donkey and a lovely gentle character. Many people ask after him as he was the donkey most often seen standing in the street for photographs because he was so good at it. We were worried that his friend Barney would pine for him but fortunately he has not.We know he misses Kiwi though because he has taken to being grumpy with Wellington!